Our 19th century horse-drawn manual fire engine is one of my favourite objects in the collection here, but definitely proved one of the most challenging to move as part of our big packing project. 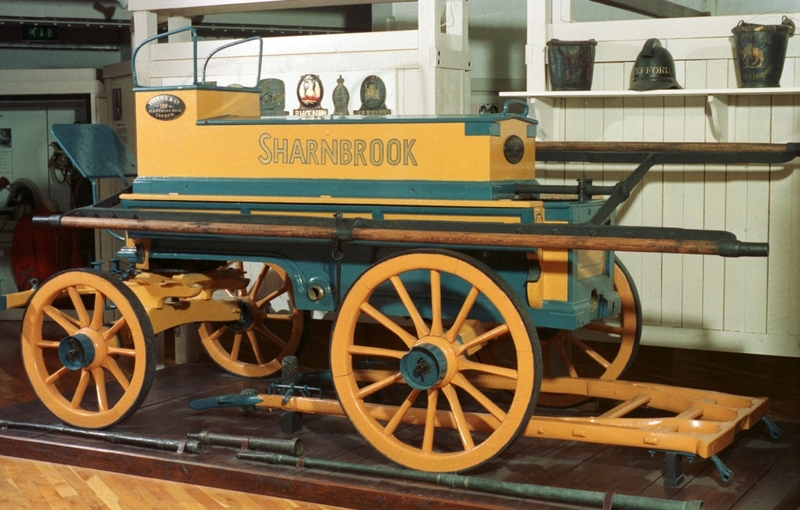 The engine was used by the Sharnbrook Volunteer Fire Brigade, founded by Daniel Hipwell of Stoke Mills, from 1832 until the early 20th century. It was one of the most difficult objects to move because of its size and the fact that it had been on display in a first floor gallery since the early 1980’s. The challenge was how to get it out of the building via some fairly narrow stairs and a small goods lift! Early on we consulted a specialist removal firm and it was decided that the only feasible solution would be to separate it into its component parts. This would need to be done very delicately to avoid damaging the restored paint work and in order to support the overall structure throughout the operation. We discovered that the engine had been taken apart for some restoration work when it was first displayed at the Museum in 1984. At this time, it had been restored back to its original colours of blue and orange. The gradual dismantling of the engine was a very time consuming process, each part needing assessment to ensure the support and safety of both the object and those working on it. First of all, the driving seat and the top section of the engine were lifted off with relative ease. Next, the iron and wood pumping arm mechanism was removed. The really tricky part was removing the hefty wheel axels from underneath the core base unit, which was done with a great deal of care. To get the larger components of the vehicle out of the building, some of the old display panels and furniture had to be taken apart to access the lift and stairs. We were all grateful that the two main sections of the body of the fire engine just about squeezed into the lift (with millimetres to spare!). 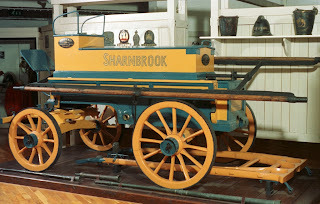 The fire engine successfully made it into our store and was partially reconnected together, ready and waiting to be redisplayed – perhaps we will avoid placing such a big vehicle on the first floor in the future!